One of Las Vegas' most highly regarded grocery stores will be closing their doors. Glazier's food marketplace has announced that they will close soon. 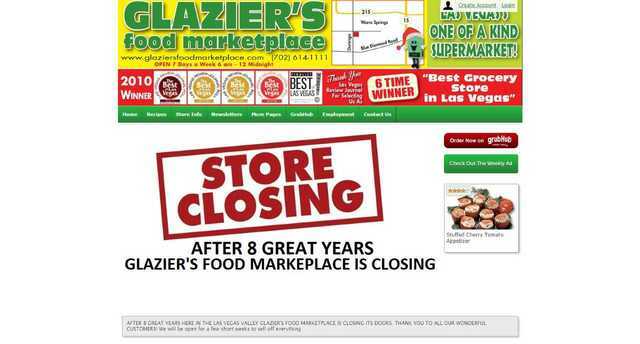 "After 8 great years here in the Las Vegas valley, Glazier's food marketplace is closing its doors. Thank you to all our wonderful customers! We will be open for a few short weeks to sell off everything." - via Glazier's website. There are many people in the Las Vegas valley that will be saddened by this news, but the sale prices on items should serve as a small parting gift. The independent supermarket was owned and operated by the Glazier family. William Glazier said "family health reasons" were behind the decision to say good-bye. He says a Smith's Grocery will be replacing his shop. Disappointed shoppers will be sad to see the "mom and pop" go. "It's a place where you say hello to people," said Ina Holiday, a longtime customer. "You see the same people, you get to know the people that work here because that's what local business is all about." One of the reasons the grocery store is so popular is because customers can often find a food that reminds them of home. Many of the items sold by the grocery store are available because customers requested them specifically. In addition, many of the items in the deli are based on recipes from Helen Glazier. The store's grab-and-go food is especially popular. Some of the available items include Cincinnati three-way chili, mashed potatoes, eggplant Parmigiana, dozens of potato salads, pasta salad, and old-fashioned dishes such as cucumbers in sour cream. The meat and seafood case at the store is also a wonder to behold. It is normally filled with prime boneless rib-eye, clams, chicken breasts, carne asada, a variety of shrimp, and sausages.